The 2018 FIFA Warld Cup Feenal wis a fitbaw spiel that determined the winner o the 2018 FIFA Warld Cup. 30 meenits o extra time if necessar. Penalty shuit-out if scores still level. Maximum o three substitutions, wi a fowert alloued in extra time. 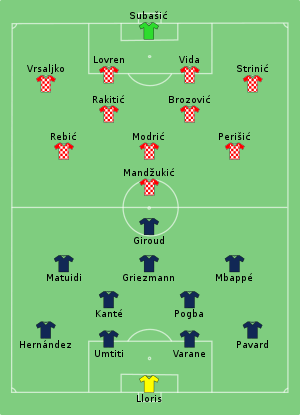 ↑ 1.0 1.1 "France v Croatia – Man of the Match". FIFA.com. Fédération Internationale de Football Association. 15 July 2018. Retrieved 15 July 2018. ↑ "Nestor Pitana to referee World Cup Final". FIFA.com. Fédération Internationale de Football Association. 12 July 2018. Retrieved 12 July 2018. ↑ "Match report – Final – France v Croatia" (PDF). FIFA. 15 July 2018. Retrieved 15 July 2018. This page wis last eeditit on 22 November 2018, at 02:38.